(04/04/2019) Satan Rules Over Torment? Where did the belief that “The devil rules hell and his demons torture the souls that go there for eternity” come from exactly? The Bible literally doesn’t even say that. 1. Matthew 4: 1-10, King James Version (KJV): 1 Then was Jesus led up of the Spirit into the wilderness to be tempted of the devil. 2 And when he had fasted forty days and forty nights, he was afterward an hungred. 3 And when the tempter came to him, he said, If thou be the Son of God, command that these stones be made bread. 4 But he answered and said, It is written, Man shall not live by bread alone, but by every word that proceedeth out of the mouth of God. 5 Then the devil taketh him up into the holy city, and setteth him on a pinnacle of the temple, 6 And saith unto him, If thou be the Son of God, cast thyself down: for it is written, He shall give his angels charge concerning thee: and in their hands they shall bear thee up, lest at any time thou dash thy foot against a stone. 7 Jesus said unto him, It is written again, Thou shalt not tempt the Lord thy God. 8 Again, the devil taketh him up into an exceeding high mountain, and sheweth him all the kingdoms of the world, and the glory of them; 9 And saith unto him, All these things will I give thee, if thou wilt fall down and worship me. 10 Then saith Jesus unto him, Get thee hence, Satan: for it is written, Thou shalt worship the Lord thy God, and him only shalt thou serve. 2. 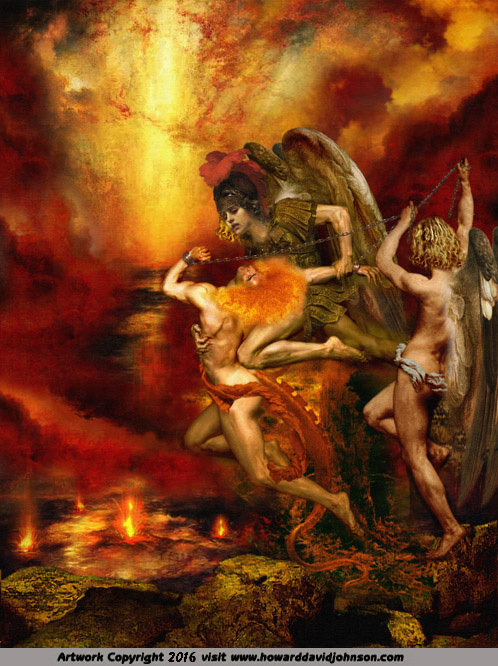 Revelation 12: 7-10, KJV: 7 And there was war in heaven: Michael and his angels fought against the dragon; and the dragon fought and his angels, 8 And prevailed not; neither was their place found any more in heaven. 9 And the great dragon was cast out, that old serpent, called the Devil, and Satan, which deceiveth the whole world: he was cast out into the earth, and his angels were cast out with him. 10 And I heard a loud voice saying in heaven, Now is come salvation, and strength, and the kingdom of our God, and the power of his Christ: for the accuser of our brethren is cast down, which accused them before our God day and night. There is far more that should be said, correctly examined, and spiritually apprehended. (For example, 3. John 8: 42-45, KJV: 42 Jesus said unto them, If God were your Father, ye would love me: for I proceeded forth and came from God; neither came I of myself, but he sent me. 43 Why do ye not understand my speech? even because ye cannot hear my word. 44 Ye are of your father the devil, and the lusts of your father ye will do. He was a murderer from the beginning, and abode not in the truth, because there is no truth in him. When he speaketh a lie, he speaketh of his own: for he is a liar, and the father of it. 45 And because I tell you the truth, ye believe me not.) Even so, I trust this fragment will be useful. Be it unto you according to your faith. If people are made wicked and evil by the devil, why didn’t god just kill the devil instead of murdering the entire world population? 1. Given that divinity is immortal and immutable, the character, makeup, process and substance for many elements within the divine Creation of heaven and earth display completeness, duration, integrity, permanence, eternal purpose, and the sovereign will of GOD. 2. While there are angels, sacred beasts, and men existing in heaven who have been resurrected or translated from the earth that are not mortal and who display personhood and self-will, only GOD displays divine fullness, and is everlasting and immortal. Inseparable aspects of spirit content are to appear as Christ-likeness and the image of GOD. Included are balance, faith, forbearance, holiness, joy, longsuffering, lovingkindness, oneness without sameness, restraint, wisdom, and wrath against sin. 3. Both death (the completion or finish of ones mortality) and the second death (annihilation) are incurred as a sanction of divine law used to acknowledge the presence or lack of sacred substances (we say, breath, life essence, spirit, word) imparted from the makeup of GOD that are required for the living to communicate, exchange and interact with divinity in ongoing relationships (we say, to exist as life companions with GOD). There is far more that should be said, correctly examined, and spiritually apprehended. (For example, 4. Devils may not be killed or lose their endowment of consciousness and will; and they are neither mortal nor immortal. Even so, they endure at the discretion of divinity, and may be utterly destroyed using holy fire that make visible otherwise unseen divine order, dominion, and final judgment.) Even so, I trust this fragment will be useful. Be it unto you according to your faith. (01/21/2019) The Divinity of Peter? According to the Bible (thanks, @Cool Dude!) PETER can raise people from the dead. Is Peter divine? “Princess”, mature Christian believers do not regard Peter as having been an aspect of divine fullness (we say, divinity; the Godhead; the Father, the Son, and the Holy Spirit). Along with eleven other disciples, Peter was chosen to serve as an apostle of Jesus Christ. All of the apostles received an endowment of spirit substance from the makeup of divinity (we say, the imparted, indwelling Spirit) that included faith, holiness, longsuffering, lovingkindness, wisdom, and wrath against sin. In addition to serving as heralds and spokespersons sent ahead to gather and prepare the congregations who would hear and receive Jesus as an itinerant preacher, the apostles were authorized as agents of the incarnate ministry of Christ who were to perform exorcism, healing, raising the dead, and other sacred events (we say, miracles). Raising the dead on the earth (we also say, restoring the dead to life; reviving the dead) is not the same as resurrection that enables the spirit separated from the body of a deceased person to exist again in flesh so they may appear in judgment as living in the presence of GOD). Peter and his brother Andrew both had standing as covenant partners and heirs of GOD through their inheritance from the promises to Abraham, Moses, and David. Thus, in accordance with the “law and the prophets” they first received Jesus Christ as a prophet. However, like Jacob, Peter had to endure correction, being humbled by GOD, gradual growth, and the outworking of divine prophecy before he would realize the true substance of his inheritance, and himself to be in a lasting relationship with divinity. On the day of Pentecost, Peter received additional spiritual gifts through the falling of the Holy Spirit that included greater faith, government, insight, meekness, personhood, oneness without sameness, and zeal. Peter and the other apostles became divine instruments ordained with the holy angels to give eyewitness testimony through the judgment of GOD that Jesus Christ was baptized, was transfigured, and is alive following his crucifixion and burial; certify the genuine appearance and falling of (sudden in-filling by) the Holy Spirit; confirm and impart the Holy Spirit by “laying on of hands;” and serve the Risen Lord as bishops and elders of the early church. 1. Matthew 16: 13-23, King James Version (KJV): 13 When Jesus came into the coasts of Caesarea Philippi, he asked his disciples, saying, Whom do men say that I the Son of man am? 14 And they said, Some say that thou art John the Baptist: some, Elias; and others, Jeremias, or one of the prophets. 15 He saith unto them, But whom say ye that I am? 16 And Simon Peter answered and said, Thou art the Christ, the Son of the living God. 17 And Jesus answered and said unto him, Blessed art thou, Simon Barjona: for flesh and blood hath not revealed it unto thee, but my Father which is in heaven. 18 And I say also unto thee, That thou art Peter, and upon this rock I will build my church; and the gates of hell shall not prevail against it. 19 And I will give unto thee the keys of the kingdom of heaven: and whatsoever thou shalt bind on earth shall be bound in heaven: and whatsoever thou shalt loose on earth shall be loosed in heaven. 20 Then charged he his disciples that they should tell no man that he was Jesus the Christ. 21 From that time forth began Jesus to shew unto his disciples, how that he must go unto Jerusalem, and suffer many things of the elders and chief priests and scribes, and be killed, and be raised again the third day. 22 Then Peter took him, and began to rebuke him, saying, Be it far from thee, Lord: this shall not be unto thee. 23 But he turned, and said unto Peter, Get thee behind me, Satan: thou art an offence unto me: for thou savourest not the things that be of God, but those that be of men. 2. John 21: 12-19, KJV: 12 Jesus saith unto them, Come and dine. And none of the disciples durst ask him, Who art thou? knowing that it was the Lord. 13 Jesus then cometh, and taketh bread, and giveth them, and fish likewise. 14 This is now the third time that Jesus shewed himself to his disciples, after that he was risen from the dead. 15 So when they had dined, Jesus saith to Simon Peter, Simon, son of Jonas, lovest thou me more than these? He saith unto him, Yea, Lord; thou knowest that I love thee. He saith unto him, Feed my lambs. 16 He saith to him again the second time, Simon, son of Jonas, lovest thou me? He saith unto him, Yea, Lord; thou knowest that I love thee. He saith unto him, Feed my sheep. 17 He saith unto him the third time, Simon, son of Jonas, lovest thou me? Peter was grieved because he said unto him the third time, Lovest thou me? And he said unto him, Lord, thou knowest all things; thou knowest that I love thee. Jesus saith unto him, Feed my sheep. 18 Verily, verily, I say unto thee, When thou wast young, thou girdest thyself, and walkedst whither thou wouldest: but when thou shalt be old, thou shalt stretch forth thy hands, and another shall gird thee, and carry thee whither thou wouldest not. 19 This spake he, signifying by what death he should glorify God. And when he had spoken this, he saith unto him, Follow me. 3. 2nd Peter 1: 16-21, KJV: 16 For we have not followed cunningly devised fables, when we made known unto you the power and coming of our Lord Jesus Christ, but were eyewitnesses of his majesty. 17 For he received from God the Father honour and glory, when there came such a voice to him from the excellent glory, This is my beloved Son, in whom I am well pleased. 18 And this voice which came from heaven we heard, when we were with him in the holy mount. 19 We have also a more sure word of prophecy; whereunto ye do well that ye take heed, as unto a light that shineth in a dark place, until the day dawn, and the day star arise in your hearts: 20 Knowing this first, that no prophecy of the scripture is of any private interpretation. 21 For the prophecy came not in old time by the will of man: but holy men of God spake as they were moved by the Holy Ghost. There is far more that should be said, correctly examined, and spiritually apprehended. (For example, 4. 2nd Corinthians 4: 6-7, KJV: 6 For God, who commanded the light to shine out of darkness, hath shined in our hearts, to give the light of the knowledge of the glory of God in the face of Jesus Christ. 7 But we have this treasure in earthen vessels, that the excellency of the power may be of God, and not of us.) Even so, I trust this fragment will be useful. Be it unto you according to your faith. What did Lucifer the angel do that God cast him out of heaven to hell? 1. Most Christian believers acknowledge the information provided to mankind that makes immortal, immutable, invisible divinity knowable, known, accessible and approachable (we say, the revelation) includes sacred events before the foundations of heaven and earth (i.e., preexistence), occurrences and patterns on earth that copy those from heaven as well as the operations of sacred spirit contained and embodied in human form. 2. The language and mind-set that must be used when considering the events of heaven must be sacred knowledge (e.g., divine law; eternal purpose; covenant promises; prophecy) and the full system of things that are spirit in place of secular knowledge and the use of carnal, material, and social things that often results in spiritual confusion. 3. Because many of us think of defiance of GOD and rebellion as expressions of anger, bitterness, and violence, we often fail to grasp that opposition to GOD may be in quiet forms that include complaining; conspiracy (organized opposition that is hidden or secret); contradiction; encouraging dissatisfaction; being inconsistent (we say, wishy-washy); being indifferent (lacking enthusiasm and zeal); lying; being opinionated; presumption; exaggerated pride (we say, arrogance, haughtiness); refusing correction; self-promotion; being stubborn; and unnatural affection (responding to loved ones and others as idols). 4. Sacred process includes the accomplishment of divine ends by using agents, messengers, spokespersons, and living vessels of consecrated substance from the makeup of divine fullness (the GODhead; the Trinity; the Father, the Son, the Holy Spirit). Included are faith, forbearance, holiness, restraint, righteousness, wisdom, and wrath against sin). Also, emblems, sacred objects, and holy writings are used to convey consciousness of divine person, presence, and sovereign will without promoting their worship as idols. (1.) Numbers 16: 1-3, King James Version (KJV): 1 Now Korah, the son of Izhar, the son of Kohath, the son of Levi, and Dathan and Abiram, the sons of Eliab, and On, the son of Peleth, sons of Reuben, took men: 2 And they rose up before Moses, with certain of the children of Israel, two hundred and fifty princes of the assembly, famous in the congregation, men of renown: 3 And they gathered themselves together against Moses and against Aaron, and said unto them, Ye take too much upon you, seeing all the congregation are holy, every one of them, and the Lord is among them: wherefore then lift ye up yourselves above the congregation of the Lord? (2.) Numbers 16: 8-14, KJV: 8 And Moses said unto Korah, Hear, I pray you, ye sons of Levi: 9 Seemeth it but a small thing unto you, that the God of Israel hath separated you from the congregation of Israel, to bring you near to himself to do the service of the tabernacle of the Lord, and to stand before the congregation to minister unto them? 10 And he hath brought thee near to him, and all thy brethren the sons of Levi with thee: and seek ye the priesthood also? 11 For which cause both thou and all thy company are gathered together against the Lord: and what is Aaron, that ye murmur against him? 12 And Moses sent to call Dathan and Abiram, the sons of Eliab: which said, We will not come up: 13 Is it a small thing that thou hast brought us up out of a land that floweth with milk and honey, to kill us in the wilderness, except thou make thyself altogether a prince over us? 14 Moreover thou hast not brought us into a land that floweth with milk and honey, or given us inheritance of fields and vineyards: wilt thou put out the eyes of these men? we will not come up. (3.) Numbers 28-33, KJV: 28 And Moses said, Hereby ye shall know that the Lord hath sent me to do all these works; for I have not done them of mine own mind. 29 If these men die the common death of all men, or if they be visited after the visitation of all men; then the Lord hath not sent me. 30 But if the Lord make a new thing, and the earth open her mouth, and swallow them up, with all that appertain unto them, and they go down quick into the pit; then ye shall understand that these men have provoked the Lord. 31 And it came to pass, as he had made an end of speaking all these words, that the ground clave asunder that was under them: 32 And the earth opened her mouth, and swallowed them up, and their houses, and all the men that appertained unto Korah, and all their goods. 33 They, and all that appertained to them, went down alive into the pit, and the earth closed upon them: and they perished from among the congregation. (4.) Luke 14: 16-24, KJV: 16 Then said he unto him, A certain man made a great supper, and bade many: 17 And sent his servant at supper time to say to them that were bidden, Come; for all things are now ready. 18 And they all with one consent began to make excuse. The first said unto him, I have bought a piece of ground, and I must needs go and see it: I pray thee have me excused. 19 And another said, I have bought five yoke of oxen, and I go to prove them: I pray thee have me excused. 20 And another said, I have married a wife, and therefore I cannot come. 21 So that servant came, and shewed his lord these things. Then the master of the house being angry said to his servant, Go out quickly into the streets and lanes of the city, and bring in hither the poor, and the maimed, and the halt, and the blind. 22 And the servant said, Lord, it is done as thou hast commanded, and yet there is room. 23 And the lord said unto the servant, Go out into the highways and hedges, and compel them to come in, that my house may be filled. 24 For I say unto you, That none of those men which were bidden shall taste of my supper. There is far more that should be said, correctly examined, and spiritually apprehended. (For example, (5.) Jude 5-7: KJV: 5 I will therefore put you in remembrance, though ye once knew this, how that the Lord, having saved the people out of the land of Egypt, afterward destroyed them that believed not. 6 And the angels which kept not their first estate, but left their own habitation, he hath reserved in everlasting chains under darkness unto the judgment of the great day. 7 Even as Sodom and Gomorrha, and the cities about them in like manner, giving themselves over to fornication, and going after strange flesh, are set forth for an example, suffering the vengeance of eternal fire.) Even so, I trust this fragment will be useful. Be it unto you according to your faith. When Satan tempted Jesus three times, why did Jesus choose to submit the first two times? 1. To avoid spiritual confusion, the temptation of Christ should be acknowledged as a sacred event that focuses upon aspects of divine character, eternal purpose, and the spirit substance from the makeup of GOD that has been imparted to created beings and living creatures including angels and unclean spirits. 2. In the understanding of many mature Christian believers, Satan appeared having the purpose of challenging the authenticity of Jesus Christ as a man on the earth by boasting his own dominion over the inheritance bestowed on Adam as a son of GOD. 3. Christ was guided by the Holy Spirit into the wilderness following his baptism at the Jordan River. There he would be isolated, without food, water, and the usual comforts of men. Prepared only for fasting and prayer; he also would have to endure the extremes of cold nights and burning days. The focus of Jesus was to discover the Father’s intent and sacred process for ministry to mankind. 4. In the same way Christ did not appear having the glory and image he manifested while in heaven, it is likely that the tempter appeared in the form of a man, and did not display the recognizable adornment and regalia he had been privileged to present for ages while among the heavenly host. 5. The deceiver did not first announce himself as the Adversary of GOD, nor did he speak to proclaim his purpose. Even so, his own words would expose him. There is far more to be said, correctly examined, and spiritually apprehended. (For example, 6. By appealing to appetite (that Jesus should transform stones to bread), exaggerated religious pride (lifting Jesus above the Temple at Jerusalem, the highest, holiest place on earth), and lust for wealth and worldly power (showing Christ the fallen nations), the temptation appears designed to arouse greed, trigger concern for the flesh in place of the spirit, and draw Jesus into human submission and false worship. However, the key element for success in the use of Incarnation by the fullness of divinity (we also say, the GODhead; the Trinity; the Father, the Son, and the Holy Spirit) was the willing acknowledgment of the divine will, rather than the finite will of the created ones.) Even so, I trust this fragment will be useful. Be it unto you according to your faith. (08/21/2017) The Place of Torment? Why did Jesus go to Hell when he died? Did he do something bad? (1.) Revelation of divinity to created beings and living creatures began with their creation, and has continued ever since. (2.) The Incarnation (i.e., divinity appearing on the earth using the form of a man) required that Jesus respond to multiple streams of authority and law. As well as parental, civil, and other social standards, the Son of GOD had to respond to the natural law and operations for life upon the earth that included completing mortality; the laws for covenant relationship with divinity; the demands of promise and prophecy; and the unseen, yet, active divine laws of eternal existence. (3.) Hell as the grave and a repository for the dead is distinct from hell as the place of torment. We accept that Jesus was buried, and went to the grave. However, the Savior did not undergo the usual corruption, decay and rot of death. Representations of this appear throughout the Bible that may only be correctly recognized and responded to by using ones own spirit content from the makeup of GOD to discern the spirit that is present within such features as events, other persons, prophecy, and the holy writings. An example is seen in the separation by a pillar of fire (judgment) during the night between Moses and the pursuing army of Pharaoh. Another is in the parable of the rich man in torment, and the beggar in the bosom of Abraham. (4.) Where the place of torment is spoken of as a realm or region where the dead have awareness and self-will for eternity, believers are to be very cautious. Again, the serpent’s lie to Eve comes into view: Ye shall not surely die. Acknowledgement and embrace of the serpent’s truth also requires embracing the Lake of Fire, and the annihilation of the wicked in the second death. Because all will be judged according to the record of their own deeds out of the book of life, final judgment will have no accuser. Satan is cast into the Lake of Fire before the resurrection and final tribunal of the wicked. (5.) The understanding that Jesus Christ appeared to Adam and the other Patriarch’s, those from the time of the Judges, and those from the times of Covenant through Moses is understood in two ways: First, that Jesus appeared using angelic and other material forms to be knowable, known, and capable of affiliation and exchange with mankind (Before Abraham was I AM.). Secondly, Jesus visited the place of rest and safekeeping for those who died in hope of eventual restoration to GOD and salvation. Here, the separation of spirit from flesh at death is accounted as a parting of the divine and eternal substance imparted to the living from the person of GOD away from the carnal, instable elements from the earth that were established by the Holy Spirit (from dust thou art, unto dust thou shalt return). There is far more to be said, correctly examined, and spiritually apprehended. (For example, (6.) Believers are to be judicious, and to carefully consider the agreement and consistency among their own beliefs. What sinners and developing believers have been given as the Gospel of Jesus Christ is sufficiently challenging that mature believers tend to forgo questionable studies on death and hell. As with considering exorcism and encounters with Satan such as that experienced by Jesus following his baptism, many become “puffed up,” from exaggerated pride, others become “swallowed up” by conjecture, speculation, errors regarding the occult, and superstition. Avoiding commitment to whatever generates ungodly conflict and division, the sacred doctrines and practices acknowledged and shared within ones congregation are usually a safe path that has been approved by GOD.) Even so, I trust this fragment will be useful. Be it unto you according to your faith. (04/27/2017) Holy Fire From GOD? Christians: How can Satan burn in the lake of fire when it’s clear from this verse that angels don’t get hurt from fire? This is referencing the story of Shadrach and his 2 brothers. Satan was once an angel, so why would he suffer in Hell? Wouldn’t he view it as a nice trip to the hot springs? (1.) Leviticus 10: 1-3, King James Version (KJV): 1 And Nadab and Abihu, the sons of Aaron, took either of them his censer, and put fire therein, and put incense thereon, and offered strange fire before the LORD, which he commanded them not. 2 And there went out fire from the LORD, and devoured them, and they died before the LORD. 3 Then Moses said unto Aaron, This is it that the LORD spake, saying, I will be sanctified in them that come nigh me, and before all the people I will be glorified. And Aaron held his peace. (2.) 1st Kings 18: 21-24, KJV: 21 And Elijah came unto all the people, and said, How long halt ye between two opinions? if the LORD be God, follow him: but if Baal, then follow him. And the people answered him not a word. 22 Then said Elijah unto the people, I, even I only, remain a prophet of the LORD; but Baal’s prophets are four hundred and fifty men. 23 Let them therefore give us two bullocks; and let them choose one bullock for themselves, and cut it in pieces, and lay it on wood, and put no fire under: and I will dress the other bullock, and lay it on wood, and put no fire under: 24 And call ye on the name of your gods, and I will call on the name of the LORD: and the God that answereth by fire, let him be God. And all the people answered and said, It is well spoken. (3.) Matthew 25: 40-45, KJV: 40 And the King shall answer and say unto them, Verily I say unto you, Inasmuch as ye have done it unto one of the least of these my brethren, ye have done it unto me. 41 Then shall he say also unto them on the left hand, Depart from me, ye cursed, into everlasting fire, prepared for the devil and his angels: 42 For I was an hungred, and ye gave me no meat: I was thirsty, and ye gave me no drink: 43 I was a stranger, and ye took me not in: naked, and ye clothed me not: sick, and in prison, and ye visited me not. 44 Then shall they also answer him, saying, Lord, when saw we thee an hungred, or athirst, or a stranger, or naked, or sick, or in prison, and did not minister unto thee? 45 Then shall he answer them, saying, Verily I say unto you, Inasmuch as ye did it not to one of the least of these, ye did it not to me. (4.) Revelation 20: 13-15, KJV: 13 And the sea gave up the dead which were in it; and death and hell delivered up the dead which were in them: and they were judged every man according to their works. 14 And death and hell were cast into the lake of fire. This is the second death. 15 And whosoever was not found written in the book of life was cast into the lake of fire. There is far more to be said, correctly applied, and spiritually apprehended. (For example, (5.) Revelation 20: 9-11, KJV: 9 And they went up on the breadth of the earth, and compassed the camp of the saints about, and the beloved city: and fire came down from God out of heaven, and devoured them. 10 And the devil that deceived them was cast into the lake of fire and brimstone, where the beast and the false prophet are, and shall be tormented day and night for ever and ever. 11 And I saw a great white throne, and him that sat on it, from whose face the earth and the heaven fled away; and there was found no place for them.) Even so, I trust this fragment will be useful. Be it unto you according to your faith.